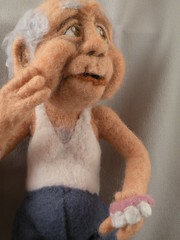 An unexpected perk of my Felt Alive business is the amazing emails I get from people just discovering needle felting. I got a great one the other day that I am compelled to share. My name is Michelle and I asked for your four disc workshop for Christmas and I got it! 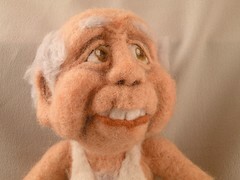 I am so happy to see how you do your stuff and make a fantastic Felt Alive doll. I discovered needle felting just a few months ago. Vriad Lee was featured on an art site I look at. I was amazed that the animals were made out of wool and I had to find out how that was possible. I did a search on youtube and the first video I watched was called Needle Felting Basic Shapes Tutorial. It was really interesting to me and I thought it was something that I might want to try. It was the very next day that I was in a bookstore and looking at the magazines. There was one that caught my eye with a Halloween cat on the cover. So I picked it up and looked through it. That's when I found the article on needle felted dolls. There were all of these l'il celebrities featured by Kay Petal. They were amazing. I couldn't believe that someone could make those amazing dolls out of wool. I went home and googled Kay Petal and found a website and blog and some other things leading to Felt Alive creations. I was so amazed by what I found. It was then that I realized that it was you that I watched on youtube at the very beginning. I showed your site to whoever would sit and listen to me go on and on about your dolls. It impressed everyone that I showed. I always saved George as the last doll I showed. I love George and that his dentures come out! HIs teeth come out! So for a few weeks I researched how to needle felt and what I would need to start. My husband works at a fabric and craft store and his store carried a few needle felting supplies which I got for my birthday. I was thrilled to try it out to see if I would like it or not. The first thing I did was a red ball. I was totally floored that I could take a blob of wool and shape it into a ball. Then I made a small penguin. He came out really cute. I was hooked at that point. I found it relaxing and fun to stab the wool. I then wanted to try out a bigger project, something for my husband for Christmas. I started in October so I would have plenty of time to get the present complete by Christmas. It only took me a few days to complete my project and in the end I was really happy how it turned out. My husband really likes anything to do with Bigfoot, so I decided to take on the challenge of making him one. I ordered up some wool from the sites you recommended, I ordered the felting pad from the site you recommended and the super duper rubber coated needles from you. I love the wool from the New England Felting Supply website. The Norwegian C-1 is perfect! Here are a few pictures of him so you can see what you inspired. When I started this project I went to a friend who is a professional illustrator. He helped me visualize Bigfoot with a concept sketch and I used this sketch as the basis of my "softie." The fact that I am in any way involved in Michelle's discovery of needle felting is really wonderful. Her enthusiasm reminded me so much of my discovery of needle felting. I am looking forward to pictures of the project she creates with her Christmas present.